The rise of national socialism in Germany should not be regarded as a conspiracy of madmen. Millions of “good” people found themselves in a society spiralling into terrible chaos. A film about then, which illuminates the terrors of now. 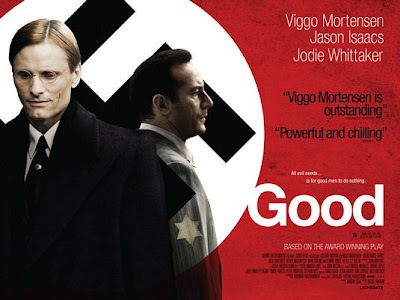 Directed by Vicente Amorim, Good is set in late 1930’s Germany, Viggo Mortensen stars as John Halder, an academic who find his early work used by the Nazis to promote national socialism. Halder’s star rises as his best friend, a Jewish doctor (Jason Isaacs), faces increasing persecution. Subtle and deeply troubling, Good stays with you long after the movie’s over. Here are interviews with the two stars and the trailer for the movie.